Meet Kivik, our new couch! We wanted a couch for our upstairs loft area that was affordable, durable, comfy, and fit well in the space. 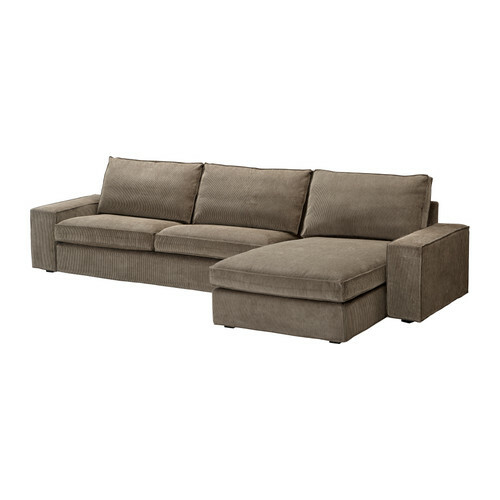 We really liked the idea of some sort of a sectional or chaise. Well, Kivik from IKEA fit all our criteria! It has a nice ribbed texture to it too and is a neutral brownish color (although they had many colors). It was kinda hard to photograph because of the texture but here it is online. I love that the chaise can be attached to either side of the couch part or it can even stand alone if you wanted it too. The cover is removeable and can be dry cleaned... awesome. Assembly was actually no problem even though as many of you know IKEA directions are only pictures and no words. We are extremely happy with our purchase! This is the couch we are looking into getting eventually. You'll have to report back on how it's holding up! I love how you kept the IKEA name, since I've never had a sofa with a name before. I love the color and the clean lines. You've definitely put me in the mood for a trip to Ikea! I like the sofa but the lamps are a great color! I was wondering what colour you got it in? I'm thinking it was the Tullinge gray-brown? They don't offer our color anymore the last time I checked but it is a brown gray color but leans more towards brown.